Ananka's Diary: Chupacabra Caught on Tape! A cop in Cuero, Texas spotted the creature shown above while on patrol. He quickly flipped on his video camera and captured some fascinating footage. The beast looks much like an ordinary dog until it turns it's head, displaying a snout that's way too long for your average pet. Whatever it is, it sure is strange. What's up with all the mutants running around and washing up on our beaches these days? That's creepy! I showed my brother and he was like "Oh, thats creepy." LOL! that was TOTALLY awesome! OoO But why didn't that police officer drive ubber fast and catch the chupacabra? Woah freaky. I've never heard of those...but that is really odd. The second one, the head was just a dog. They did a dna test. Oh, and the beach monster-- I found a picture from another angle and you can see that it doesn't really have a beak-- that's the bone of the muzzle showing through. I'd bet it's a dog too, with really bad mange and then postmortem... uh... bodies change shape in some freaky ways after death so I bet it's just normal decomposition making it look so strange. 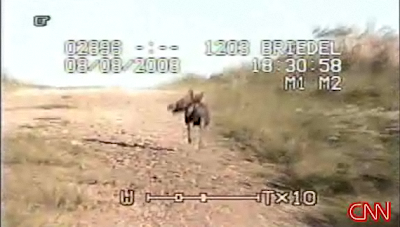 And the first picture-- maybe a dog/coyote carrying something in its mouth? I always come on and try to explain things away, but it's not that I don't like crypto-critters-- I do! It's just, you gotta look at all the options and think about things or you'll just end up looking like an idiot! Or as Fi in Disney's So Weird said, "You gotta debunk the fakes so you know when you've got the real thing!" Kirsten-san, you ever see that show? You'd like it. hmmm! Theres this one kid at school that always has said that he believes in and wants to see the chupacabra! I beieve in it! Maybe I should refer this website to him! Hopefully this is real, seeing as the Georgia Gorilla likely isn't. 0.0 wow! well, what if a chubacabra is actually an unknown species of cyote? that makes sense, right? hehe, this is awesome. lilitomboyblue11;): maybe global warming is forcing them all to come out of hiding to survive?